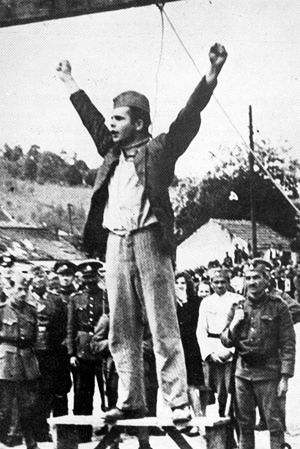 The young man striking the dramatic pose is Stjepan Filipovic, an anti-fascist partisan hanged in the city of Valjevo by the Serbian State Guard, a collaborationist force working with the Axis occupation of Yugoslavia. Filipovic is shouting “Death to fascism, freedom to the people!” — a pre-existing Communist slogan that Filipovic’s martyrdom would help to popularize. Smrt fašizmu, sloboda narodu! … or you can just abbreviate it SFSN! 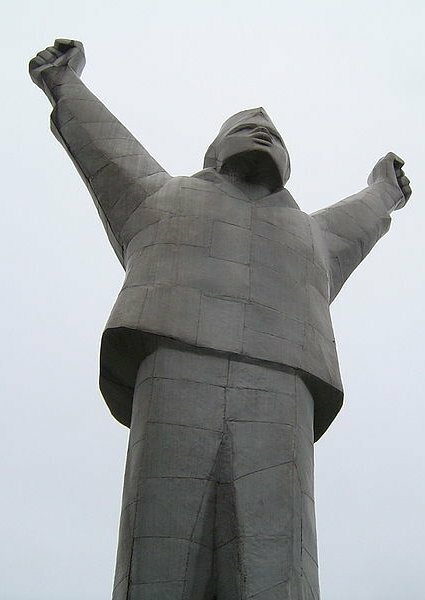 In the city where Filipovic died, which is in present-day Serbia, there’s a monumental statue in his honor replicating that Y-shaped pose — an artistically classic look just like our favorite Goya painting, poised between death and victory. Filipovic was a Communist so we’re guessing that he would not have had a lot of truck with the ethnic particularism that’s latterly consumed the Balkans. Times being what they are, however, the national hero to Tito’s Yugoslavia has become a post-Communist nationalist football.